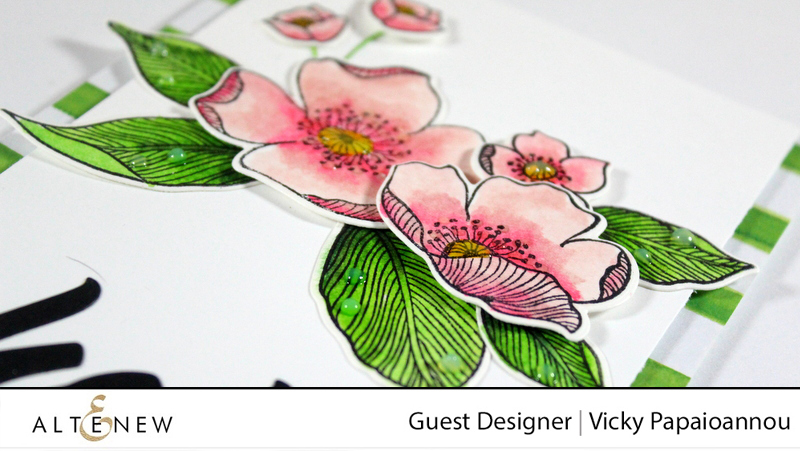 Hello, everyone and welcome to our September Guest Designer post! I live in Greece with my husband, my two kids and my cat Ginger! I love cardmaking and art journaling and I share my creations on my blog and youtube channel. My YouTube channel has been a great success over the years with a growing number of followers and that really helped me switch from a full time high school teacher into a full time independent designer and mixed media artist. I am finally doing what I love most, sharing my art with fellow crafters online and I also teach live workshops all over the world. 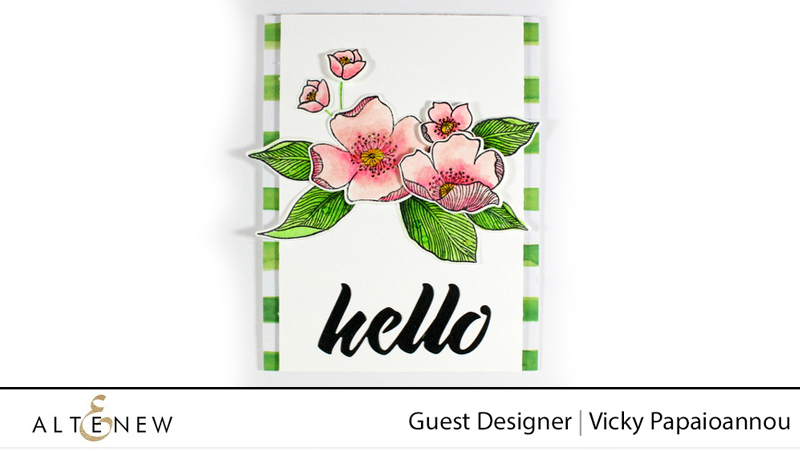 So lets jump in and take a look at Vicky’s first card, it features the ever popular Adore You Stamp Set: For this card I was going for a watercolor look. I stamped all my flowers and leaves on watercolor paper using permanent ink to avoid smudges later on. Then I used my watercolor markers but you can go ahead and recreate that look by using any watercolor medium that you have. I used the matching dies to cut out all my images and then I played a little bit with my cut outs to decide on my flower composition. Once I was happy with their placement I glued everything down. Notice that I used foam tape at the back of some die cuts to add dimension. For my sentiment I used the Hello die cut. I chose to use black cardstock for that since I love a big bold sentiment as a contrast! 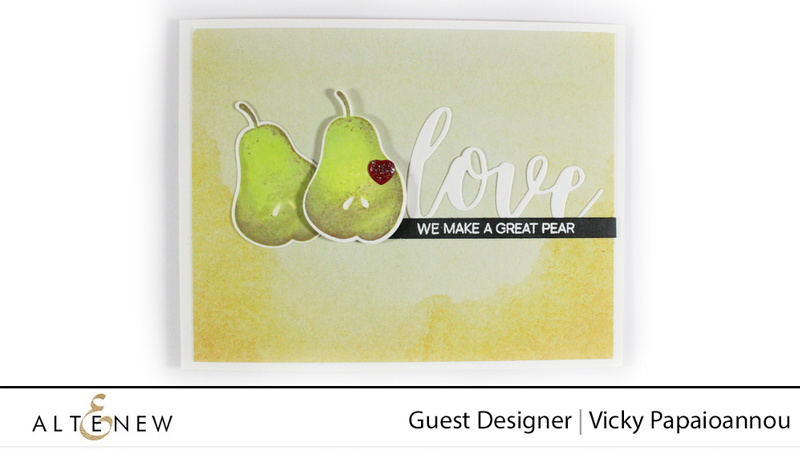 For this clean and simple love card I used the pear from the Simple Fruits stamp set. I stamped the image using my stamping platform using 3 different ink pads. I used a light green to stamp the whole image and then I touched up only areas of the stamp with darker green and even light brown. This technique allowed me to create shading from a solid stamp in seconds. 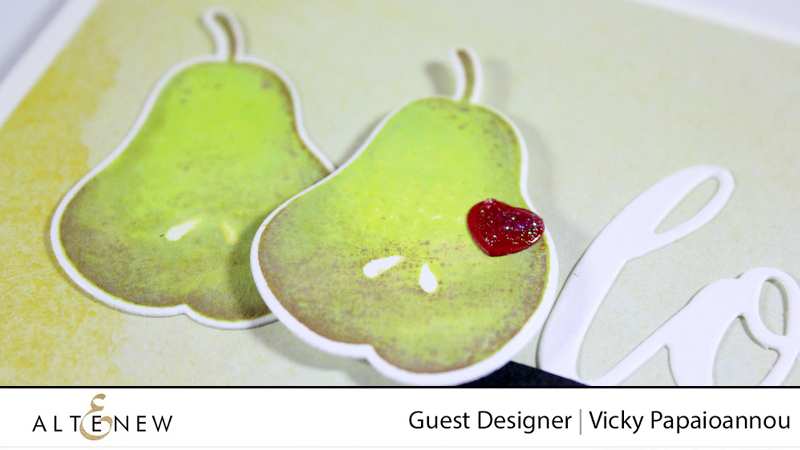 I used the matching die to cut out the pears and then aligned them on my card base. For the sentiment I combined a big bold die cut word along with a sentiment that I white embossed. Wow! How amazing were all of Vicky’s projects? We absolutely loved both of them! We hope you enjoyed Vicky’s cards as much as we did. Also make sure to visit Vicky’s Blog to see more and don’t forget to leave her some love. Thank you so much, Vicky, for being our September Guest Designer and Brand Ambassador, and for sharing your talents with us today! It was such a lovely treat to gaze at your lovely cards. Vicky is just so talented!! I am a huge fan of Vicky and of Altenew, a better combination you can’t have. Thanks for al the lovelynes you share with us! It’s always a TREAT to see Vicky’s beautiful work! Thank you for sharing your talent, Vicky! Both of these cards are beautiful but I especially love the first one! The flowers and leaves are colored perfectly! They seem to glow from within! TFS! Vick’s art is always an inspiration to my creativity. Altenew products are great to work with . Goodie as we now get more of Vicki’s talent as she’s now on Altenew’s site. 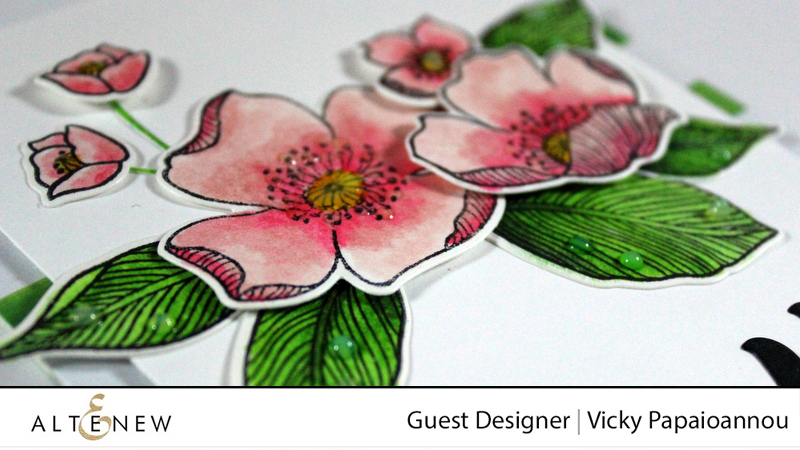 I’ve learned a lot from Vicki via her videos for stamping and art journaling. Beautiful cards Vicky! Thanks for sharing your lovely creations! 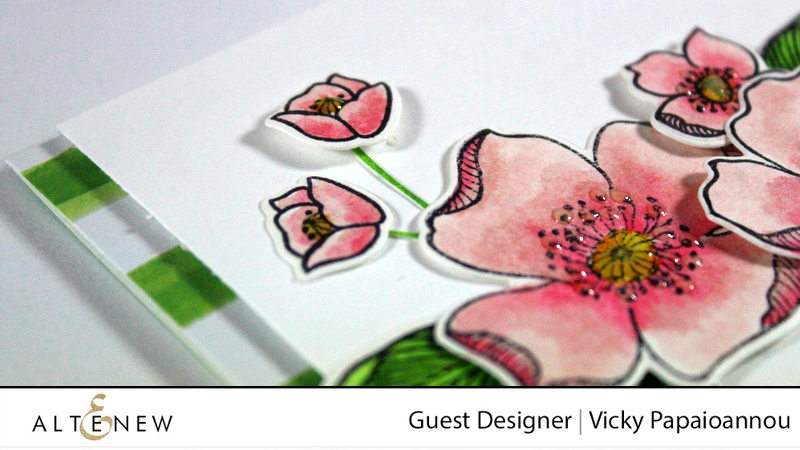 Vicky’s cards and artwork are always wonderful! I especially love the flower card but both are great! I love everything Vicki makes & these fabulous creations are no exception! I really like both cards, you always make it look so easy! Long-time follower of Vicky’s work! 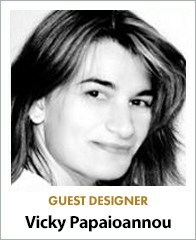 She is one of my fave designers. Thanks for featuring her amazing work this month. Can’t wait to see what she has in store for us! And after watching the vids, I can’t pick a fave—like them both! Love the Flower card for its bold color contrasts, and the second for its soft colors and that sweet sentiment work! Beautiful cards Vicki! I admit I have a love affair with pear images, adore your pear card. 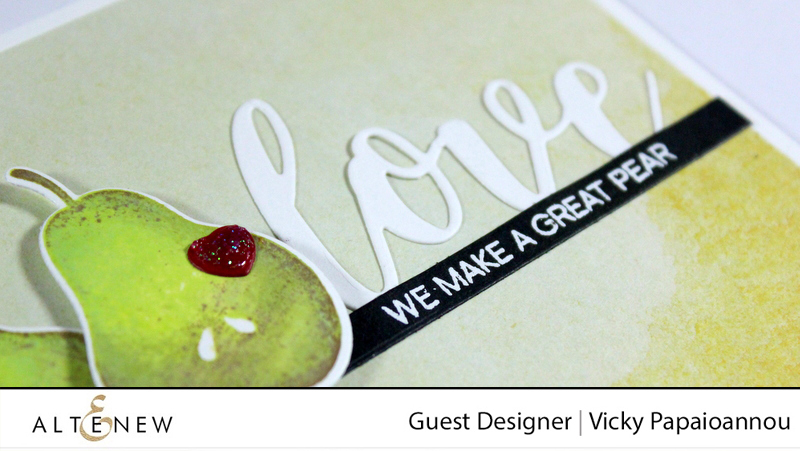 I love Vicky’s cards–great job! These are lovely. It’s always a treat to see Vicky’s work! My favorite card is the watercolor floral card! It is just gorgeous! Fantastic cards Vicky, between you and Altenew you couldn’t go wrong! Love how you did those pears Vicky. I always learn something new from you. Thanks for always sharing your talent with us. Vicky is so talented and makes such fantastic cards!